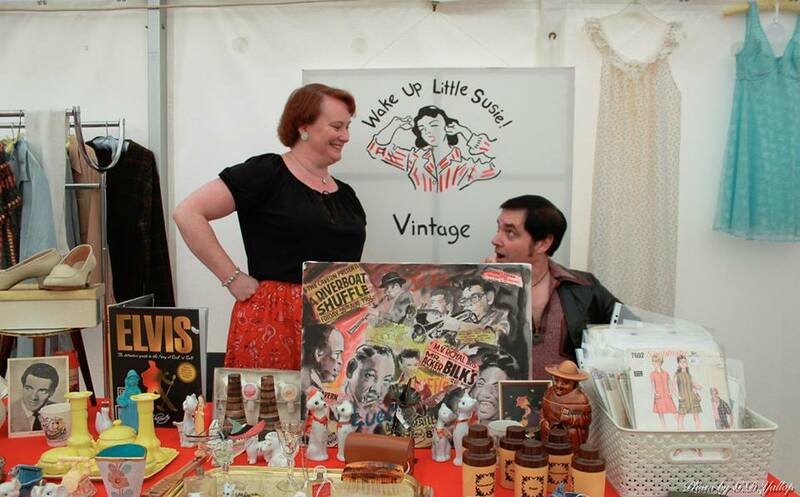 I previously filled you in on my relationship with Gressenhall Museum in Norfolk and how I came to be a part of their annual Rock ‘n’ Roll themed day…So, this year I was all geared up to do my Wake Up Little Susie stall as usual, maybe rustle up a few more fab local vintage dealers & help out with a bit of promotion…. 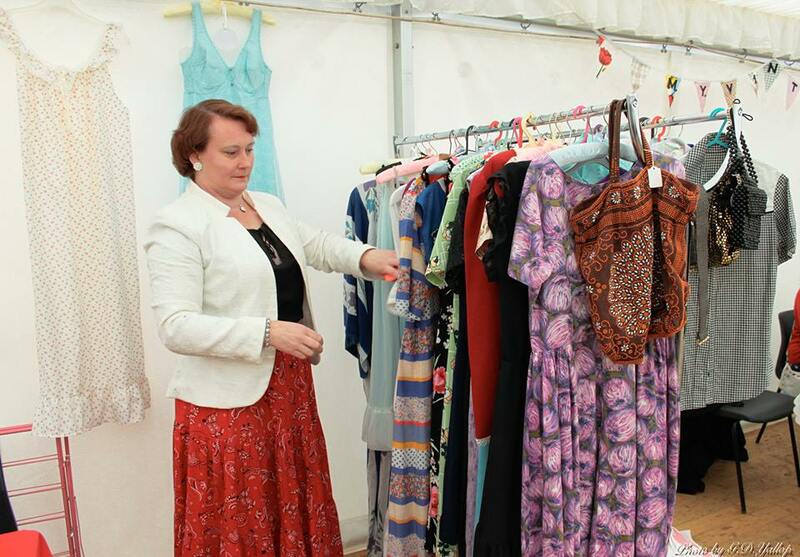 The previous year’s event was so successful that the marquee of vintage stalls, plus DJ Rockin’ Roland playing to a floor full of dancers got kinda hectic, so the plan this year was to put DJ & dancers somewhere else (teamed up with tea & cake, perfect! 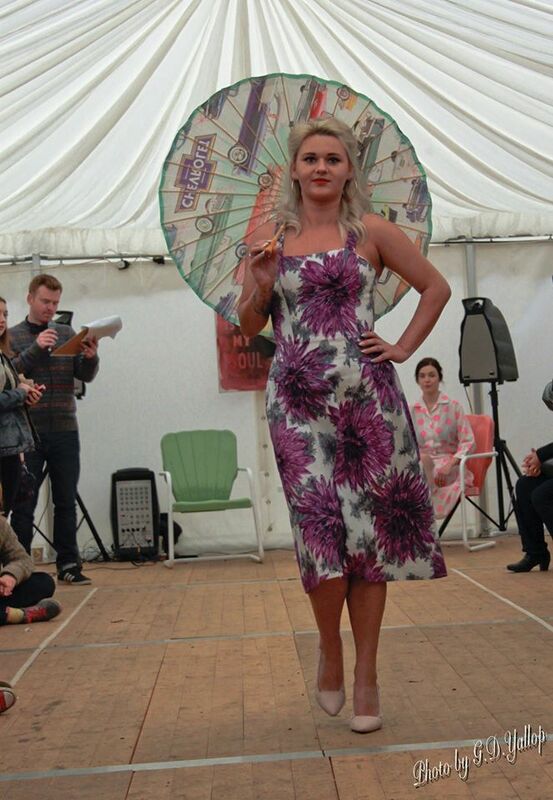 ), fill the marquee with stalls & add another attraction (always good to have something fresh each year too) – a fashion show was the answer! 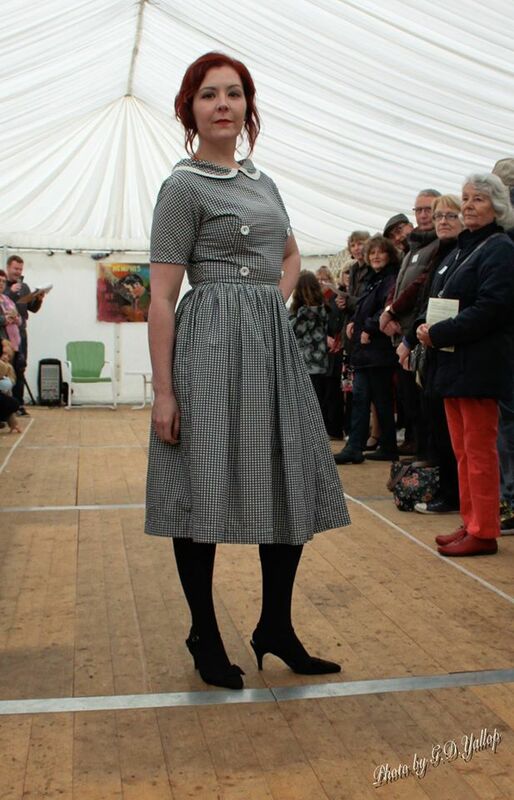 Lara thought it would be a nice way for me to showcase my own clothing, & following on I thought it would be even better to use outfits from all of the stall holders taking part, with the idea that everything you saw in the show could be bought that very day. I have to say it’s a nice feeling when someone has faith in you to deliver, and I know this was partly based on the big fashion show that I had hosted last year with Sarah from The Wedding Shed, Fly Me To The Moon . That really was hard work, so it’s good that it’s leading to other projects & if I can do that, I can do anything! As the time got closer we had a meeting (I love a good meeting!) 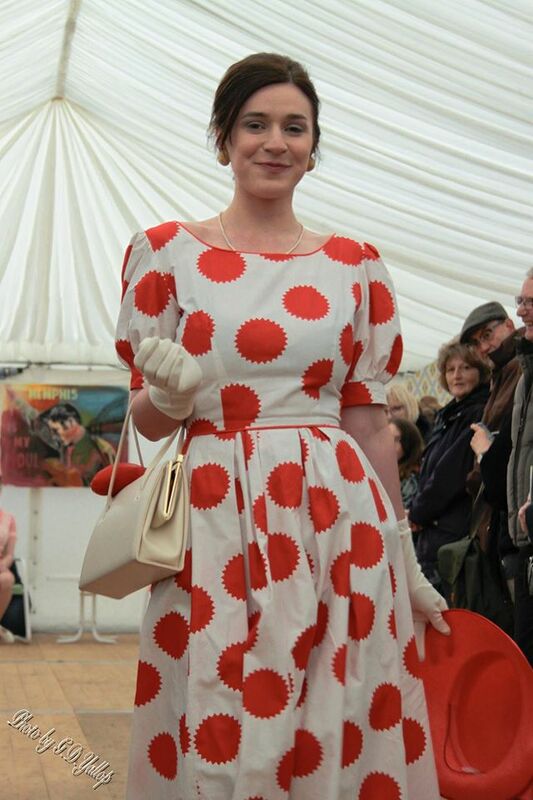 & I was pleased that Kate Cooper, fellow fan of history & fashion, was now on board too. We left with a to-do list each & I got stuck into lining up models & sounding out the other clothing retailers, while Kate was on top of hair & make-up, liaising all the time….by the time we had our final meeting we were dealing with 48 outfits from 6 retailers & 11 models…(never mind music, hair & make-up, compere…) and we literally spent 5 hours in a coffee shop matching models to outfits! (fortified with coffee & flap-jacks) It’s a good job Kate & I work together well & love what we do! I was really nervous the night before (I always am when I’m doing something new, but I think that’s a healthy thing!) & I was getting a little stressed while trying to set up my stall & worry about the models at the same time, but we ended up with a fantastic team & it went so well! 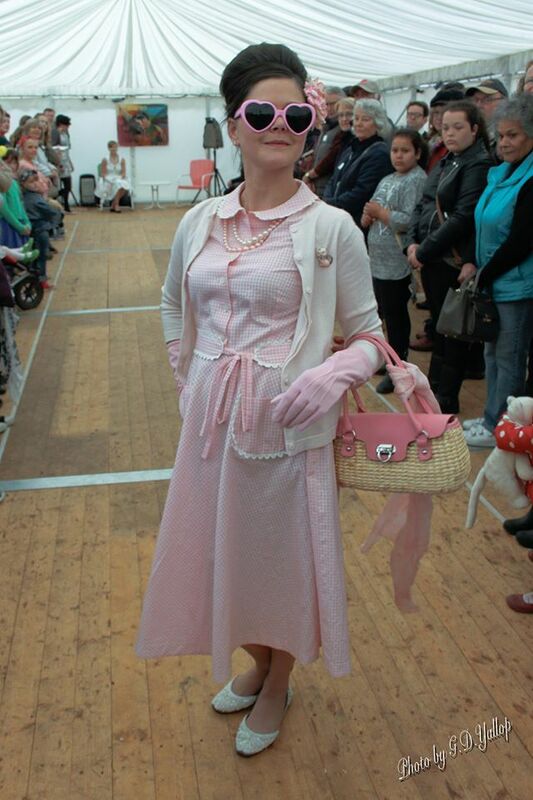 Estelle wearing Kooks Vintage, with full accessories! 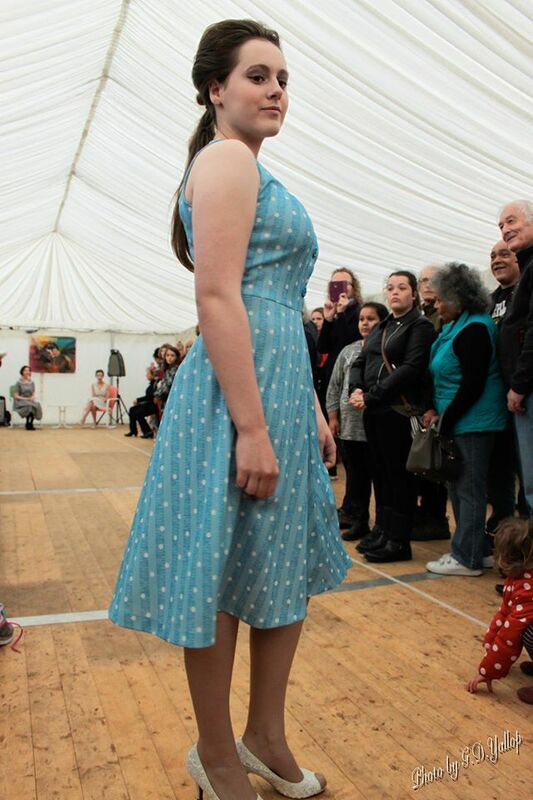 Lucy wearing Merry-Go-Round, handmade by Gill Williams using vintage fabric and an authentic 1950s sewing pattern. 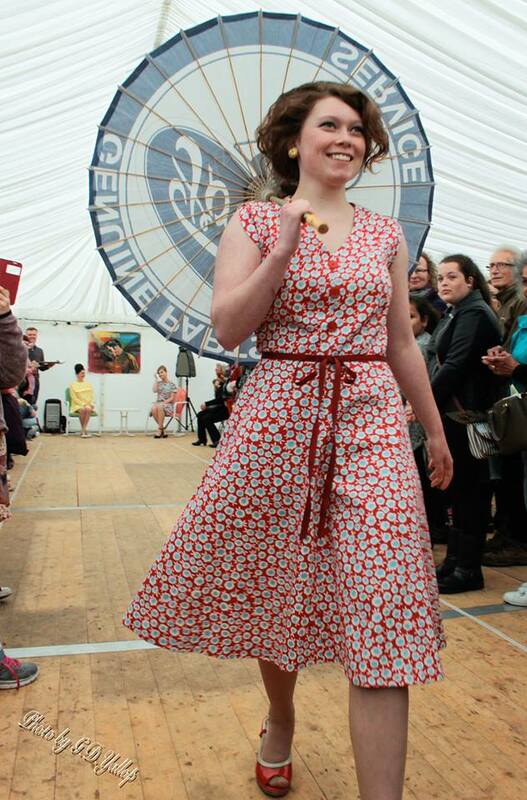 Lucy is also sporting a rather fab retro parasol from local business Swingoramic who also had a stall on the day selling their amazing range of vintage style Americana goodies. However much work one puts into a fashion show & however many great outfits are on show, they have a tendency to be over quicker than you think, so to add an extra dimension we created a backdrop that you can just see here featuring 1950s style American lawn chairs from Swingoramic plus a beautiful original painting of Elvis from my hubby Simon, of Artbeat64. 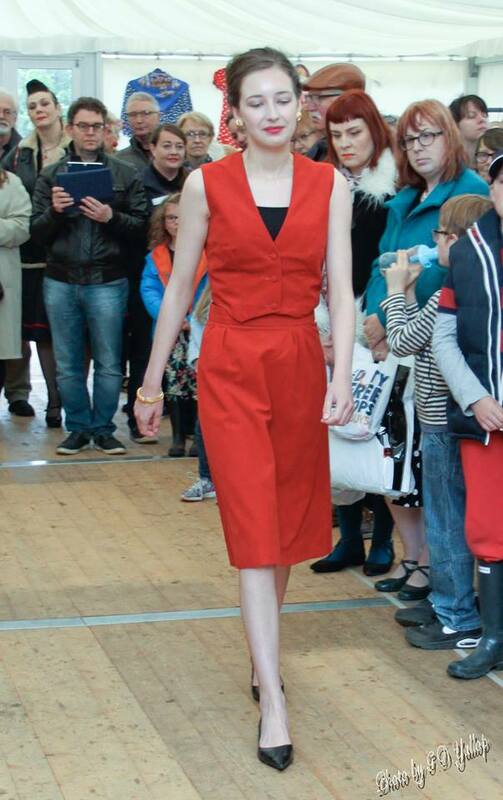 This gave a great spot for the models to sit & wait and strike a pose, as well as looking good in Gary’s photos! At the end of the first half, I must also take time to thank our incredible hair & make-up artists, Jeahan Tuddenham and Suze Rose who did a terrific job on all 10 models between just the 2 of them! 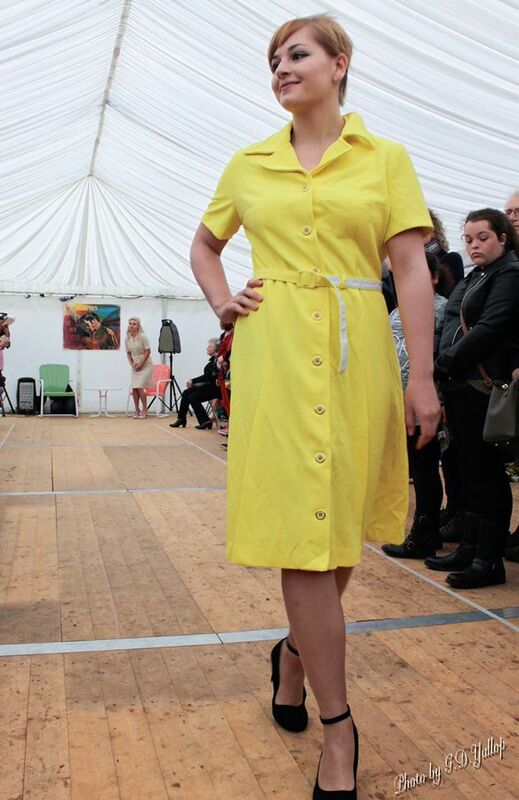 Suze even ended up on the runway at one point, modelling for Sophie from Venelle to make the numbers up! Music is always important, & I picked a 1950s & 1960s compilation CD of well known, upbeat songs to strike the right mood! 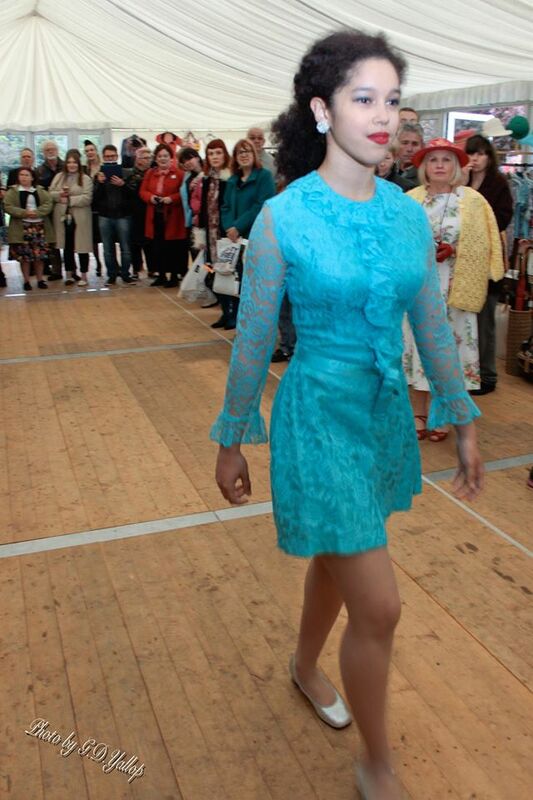 Rosy wears an incredible mini-dress from China Angels. 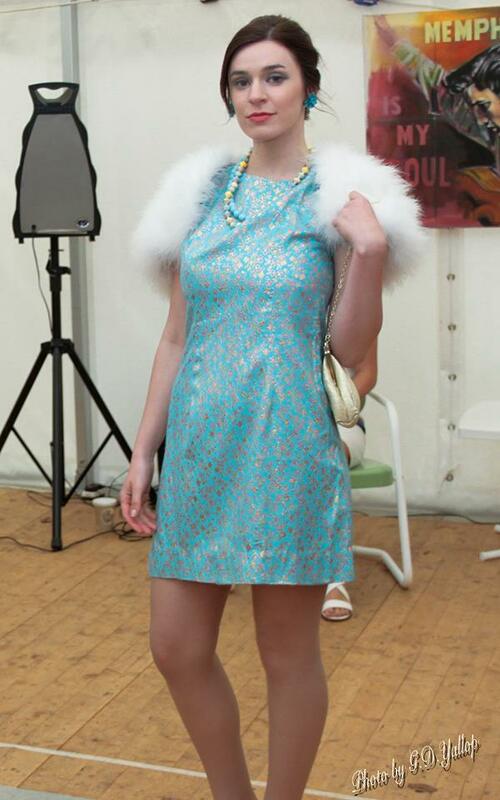 Maisie in ’60s dress & shrug from Kooks Vintage -the dress sold following the show! 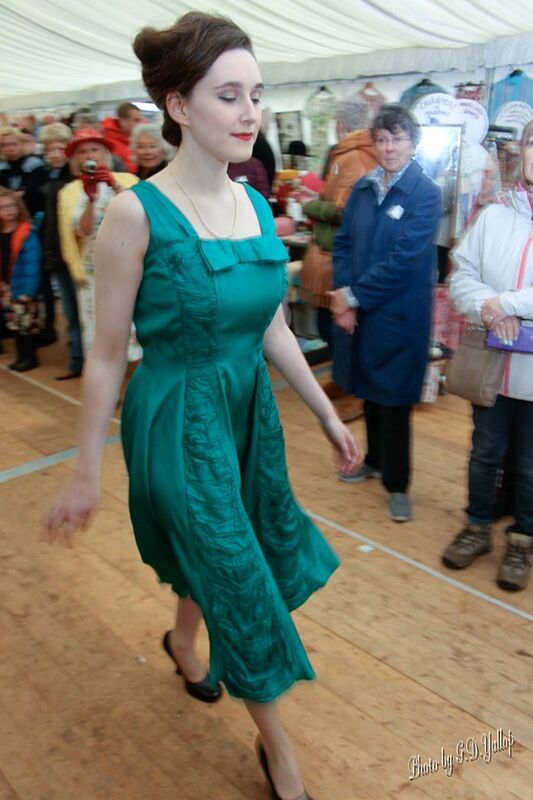 Isobel looking very elegant in Venelle Vintage. 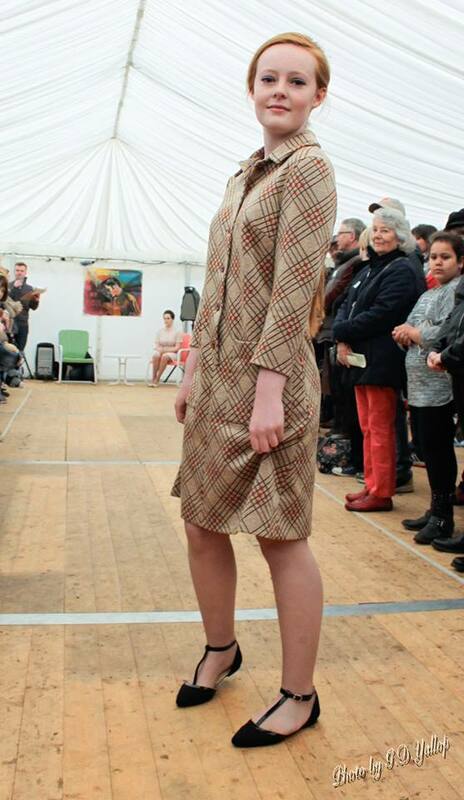 Ruby goes Mod in Forever Retro. ..and finally, of course I had to end the day with my trademark vintage nightwear, & here we have Fran looking cheeky in a cute floral house-coat! 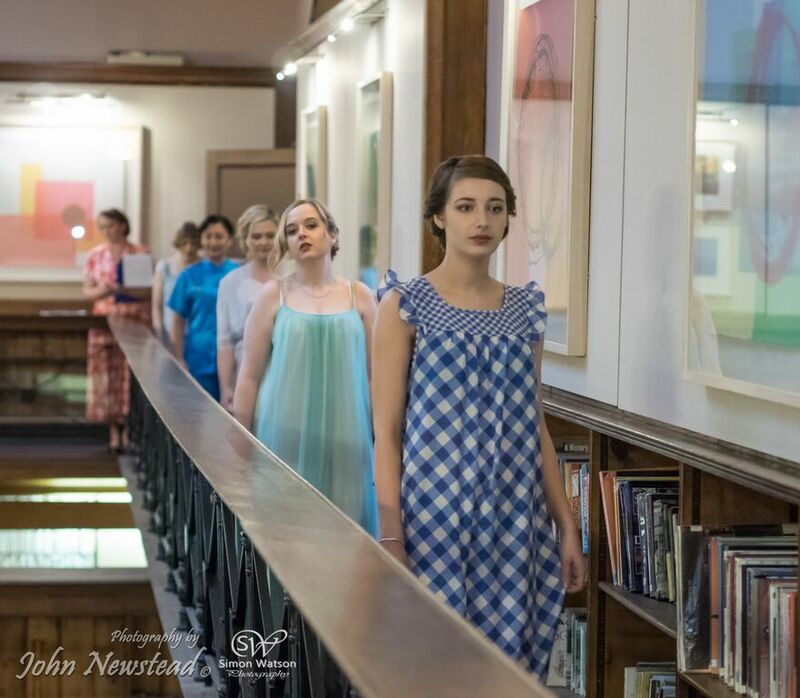 As ever, my trusty events photographer Gary Yallop worked really hard to capture every model & every outfit and believe me, it was incredibly difficult picking out which images to use for this blog! Head over to Gary’s Facebook page to see lots more. So, happy Susie & Kate! It was certainly hard work, but as usual we realised how essential it is to have a great team working with us so thanks to all the models who were wonderful & really had fun, thanks to Suze & Jeahan for giving up their Bank Holiday to do the hair & make-up, thanks to the fantastic retailers who loaned out their clothing & accessories (and there were some AMAZING outfits! ), thanks to Simon and Ed & Sophie for the backdrop, James for a brilliant job as compere, Gary for capturing all the great images for us, not forgetting my Mum, Dad & Hubby for watching my stall while I faffed with models, Lara & Miriam for inviting us and our great backstage team of Amanda, Sophie, Sarah & Melissa – it wouldn’t have gone that smoothly without you! 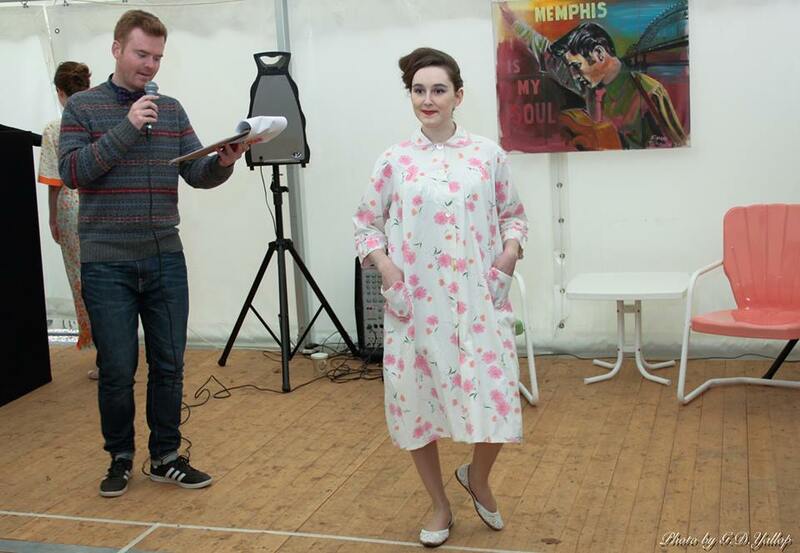 All in all, we had a great time & showed just how stylish and colourful clothing from the ’50s & ’60s can be, certainly my favourite era! Another good read Susie. Look forward to the next one.